“Apologies for all the mats and rugs Les” said Oscar’s Mum when I visited. Apologies? Oh no…….she deserved an AchyPaw Good Mum medal. She said that the wood flooring in her house didn’t help with Oscar’s mobility. She found he was wobbly and slippy. Putting mats, rugs and carpets all around might not look co-ordinated but Oscar didn’t care. He just saw safety islands and places to walk. 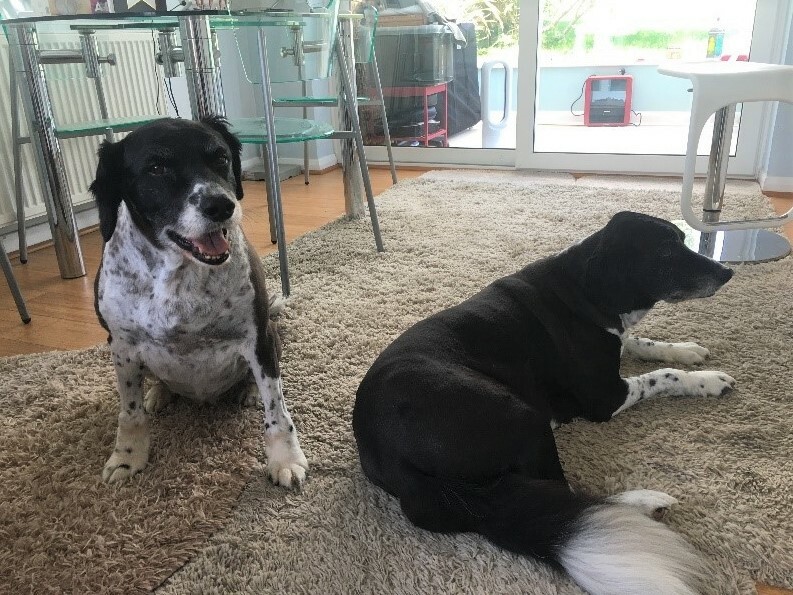 When dog Mums and Dads have opened the door to us, asking to be forgiven or explaining their irregular mats and carpets, they are met with a beaming smile from us and a “well done”. 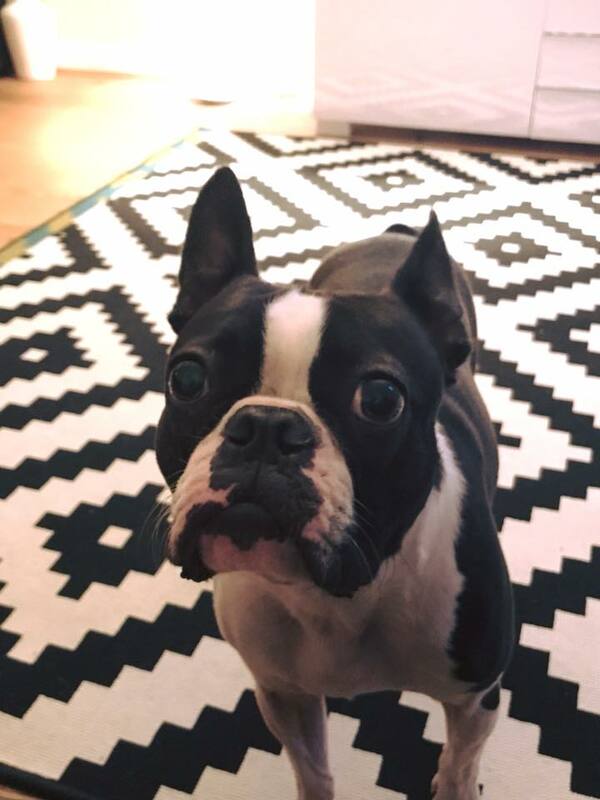 After Chris’s visit to Henry, we received an email saying “Here’s Henry on his new massive rug in the lounge – no more slippery lounge floor. His grandma and grandad bought it for him. Spoilt? Never!!”. And the rug matched his colouring. That’s cool. When I made my visit to little senior boy Blue, the floor was covered in dustsheets – not for re-decorating – but so Blue could walk around the whole house without slipping on the wooden floor. Now that was a great use of stuff you’ve probably already got around the house somewhere. 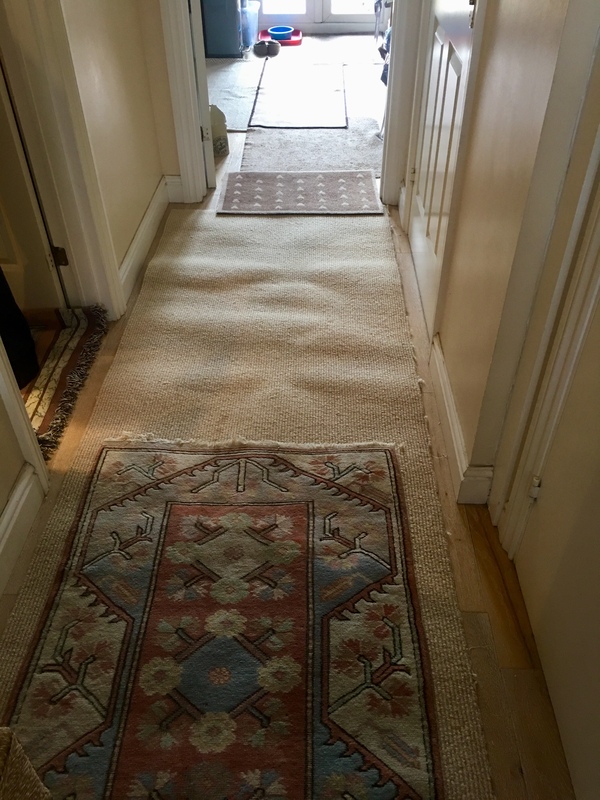 And recently, handsome chunky Hector’s Mum mentioned the carpet but it was exactly what he needed to walk without worry of skidding or sliding. It needn’t cost the earth. Use your imagination and those bits and pieces you have around the house, as long as they don’t slide across the floor. Old mats, rugs, off cuts of carpets, yoga mats, dustsheets, anything is better than slipping legs on your dog. Don’t apologise – celebrate the multi-colour irregular mats, carpets and rugs. We do! This entry was posted in acheypaw, achy paws, AchyPaw, achypaw myotherapy, arthritis management, Brighton Dog Massage, canine arthritis, canine arthritis management, canine myotherapy, dog myotherapy, achypaw myotherapy, myotherapy, achy paws, confidence boost, Dog, Dog massage, empowerment, household adaptations, injury prevention, massage benefits, multimodal therapy for dogs, not just arthritis, prevention, senior dogs, Testimonial, therapeutic massage, training and tagged achypaw, achypaw myotherapy, arthritis management, canine arthritis management, Canine massage, Dog massage, injury prevention, massage, not just arthritis, prevention, south coast dog massage, south coast myotherapy, therapeutic, therapeutic massage, www.achypaws.com. Bookmark the permalink.